So we got the news today of the left side level 2 brain bleed. Briella also had her heart echo today but we won't have the results until tomorrow morning. The echo upset her a lot & she had many alarms during it. It was about a 20 min procedure & she got irritated from being pushed on and having ultrasound goo all over her. A second nurse practitioner tried to get her picc line in today. They tried 3 times in her leg and were unsuccessful. They said that they were able to get to the artery but when they tried to thread it, it would burst. So I was told they will let her rest tomorrow. She is sedated from the morphine each time. Right now she is what they call "Riding the vent." That is where she is not initiating any or many breathes on her own. They have started her on caffeine to see if that helps her initiate. The inside of her elbow is black and blue from where they tried the picc line last night. I am so sad to see my baby hurt and have to go through this multiple times. We have to wait to see what the dr says tomorrow but the dr will either try it themselves or they will do a small surgery on her called a cut down. They will cut a small area open & try to thread it in that way. The risk of infection is higher if they continue to use & leave the iv's in here belly button in. 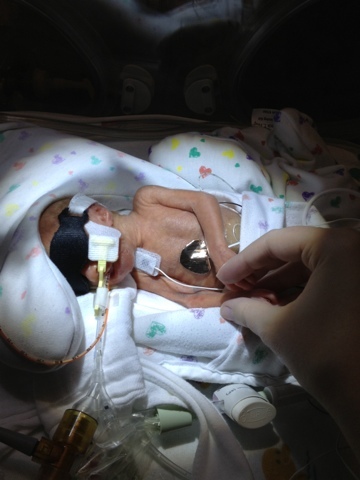 Briella's feedings were also upped to 3ml every 3 hours! Although I found a time today where milk had come up and run down her mouth, we are hoping it was a fluke and that she is tolerating the feedings well. She is still having dirty diapers so that's good. I contacted Children's Mercy Hospital today about a possible transfer. I was told that at the moment there is nothing different they can do for her than what is being done. I was hoping that she would have a dedicated nurse 24hrs a day. But it is the same as where we are, 1 nurse for 2 babies. It's just hard for me right now because the other baby our nurse shares seems to have lots of issues & constant alarms. While I'm grateful we aren't having that many problems I also get frustrated when alarms ring for too long or things don't go the way I understand that they are supposed to. Children's mercy said the big difference is that they have specialists on staff. But at the moment Briella isn't in need of specialists yet. So we will stay put and have faith that where we are at will provide top notch care for her. Please pray that Briella stays infection free, that they are successful in putting the picc in, that she continues to tolerate her feedings, that we get positive news from her echo and that the brain bleed resolves soon and does not progress. Thank you so much for the prayers and keep them coming!! !